For other uses, see Ester (disambiguation). In chemistry, esters are chemical compounds derived from an acid (organic or inorganic) in which at least one –OH (hydroxyl) group is replaced by an –O–alkyl (alkoxy) group. Usually, esters are derived from a carboxylic acid and an alcohol. Glycerides, which are fatty acid esters of glycerol, are important esters in biology, being one of the main classes of lipids, and making up the bulk of animal fats and vegetable oils. Esters with low molecular weight are commonly used as fragrances and found in essential oils and pheromones. Phosphoesters form the backbone of DNA molecules. Nitrate esters, such as nitroglycerin, are known for their explosive properties, while polyesters are important plastics, with monomers linked by ester moieties. The word 'ester' was coined in 1848 by German chemist Leopold Gmelin, probably as a contraction of the German Essigäther, "acetic ether". Ester names are derived from the parent alcohol and the parent acid, where the latter may be organic or inorganic. Esters derived from the simplest carboxylic acids are commonly named according to the more traditional, so-called "trivial names" e.g. as formate, acetate, propionate, and butyrate, as opposed to the IUPAC nomenclature methanoate, ethanoate, propanoate and butanoate. Esters derived from more complex carboxylic acids are, on the other hand, more frequently named using the systematic IUPAC name, based on the name for the acid followed by the suffix -oate. For example, the ester hexyl octanoate, also known under the trivial name hexyl caprylate, has the formula CH3(CH2)6CO2(CH2)5CH3. Ethyl acetate derived from an alcohol (blue) and an acyl group (yellow) derived from a carboxylic acid. The chemical formulas of organic esters usually take the form RCO2R′, where R and R′ are the hydrocarbon parts of the carboxylic acid and the alcohol, respectively. For example, butyl acetate (systematically butyl ethanoate), derived from butanol and acetic acid (systematically ethanoic acid) would be written CH3CO2C4H9. Alternative presentations are common including BuOAc and CH3COOC4H9. Cyclic esters are called lactones, regardless of whether they are derived from an organic or an inorganic acid. One example of a (organic) lactone is γ-valerolactone. An uncommon class of organic esters are the orthoesters, which have the formula RC(OR′)3. Triethylorthoformate (HC(OC2H5)3) is derived, in terms of its name (but not its synthesis) from orthoformic acid (HC(OH)3) and ethanol. Esters can also be derived from an inorganic acid and an alcohol. Thus, the nomenclature extends to inorganic oxo acids and their corresponding esters: phosphoric acid and phosphate esters/organophosphates, sulfuric acid and sulfate esters/organosulfates, nitric acid and nitrate, and boric acid and borates. For example, triphenyl phosphate is the ester derived from phosphoric acid and phenol. Organic carbonates are derived from carbonic acid; for example, ethylene carbonate is derived from carbonic acid and ethylene glycol. one carbon–oxygen–phosphorus bondings, no phosphorus–oxygen double bonds but two phosphorus–carbon bonds in phosphinites. structure of a generic phosphinite. In corollary, boron features borinic esters (n = 2), boronic esters (n = 1), and borates (n = 0). As oxygen is a group 16 chemical element, sulfur atoms can replace some oxygen atoms in carbon–oxygen–central inorganic atom covalent bonds of an ester. As a result, thiosulfinates' and thiosulfonates, with a central inorganic sulfur atom, demonstrate clearly the assortment of sulfur esters, that also includes sulfates, sulfites, sulfonates, sulfinates, sulfenates esters. Esters contain a carbonyl center, which gives rise to 120 ° C–C–O and O–C–O angles. Unlike amides, esters are structurally flexible functional groups because rotation about the C–O–C bonds has a low barrier. Their flexibility and low polarity is manifested in their physical properties; they tend to be less rigid (lower melting point) and more volatile (lower boiling point) than the corresponding amides. The pKa of the alpha-hydrogens on esters is around 25. Many esters have the potential for conformational isomerism, but they tend to adopt an s-cis (or Z) conformation rather than the s-trans (or E) alternative, due to a combination of hyperconjugation and dipole minimization effects. The preference for the Z conformation is influenced by the nature of the substituents and solvent, if present. Lactones with small rings are restricted to the s-trans (i.e. E) conformation due to their cyclic structure. Esters are more polar than ethers but less polar than alcohols. They participate in hydrogen bonds as hydrogen-bond acceptors, but cannot act as hydrogen-bond donors, unlike their parent alcohols. This ability to participate in hydrogen bonding confers some water-solubility. Because of their lack of hydrogen-bond-donating ability, esters do not self-associate. Consequently, esters are more volatile than carboxylic acids of similar molecular weight. Esters are generally identified by gas chromatography, taking advantage of their volatility. IR spectra for esters feature an intense sharp band in the range 1730–1750 cm−1 assigned to νC=O. This peak changes depending on the functional groups attached to the carbonyl. For example, a benzene ring or double bond in conjugation with the carbonyl will bring the wavenumber down about 30 cm−1. Esters are widespread in nature and are widely used in industry. In nature, fats are in general triesters derived from glycerol and fatty acids. Esters are responsible for the aroma of many fruits, including apples, durians, pears, bananas, pineapples, and strawberries. Several billion kilograms of polyesters are produced industrially annually, important products being polyethylene terephthalate, acrylate esters, and cellulose acetate. 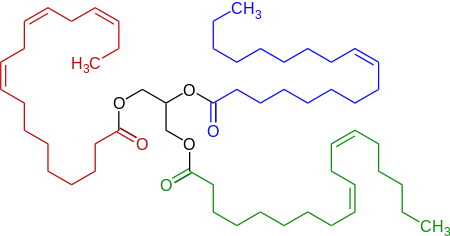 Representative triglyceride found in a linseed oil, a triester (triglyceride) derived of linoleic acid, alpha-linolenic acid, and oleic acid. Using the alcohol in large excess (i.e., as a solvent). Using a dehydrating agent: sulfuric acid not only catalyzes the reaction but sequesters water (a reaction product). Other drying agents such as molecular sieves are also effective. Removal of water by physical means such as distillation as a low-boiling azeotropes with toluene, in conjunction with a Dean-Stark apparatus. Reagents are known that drive the dehydration of mixtures of alcohols and carboxylic acids. One example is the Steglich esterification, which is a method of forming esters under mild conditions. The method is popular in peptide synthesis, where the substrates are sensitive to harsh conditions like high heat. DCC (dicyclohexylcarbodiimide) is used to activate the carboxylic acid to further reaction. DMAP (4-dimethylaminopyridine) is used as an acyl-transfer catalyst. Using this diazomethane, mixtures of carboxylic acids can be converted to their methyl esters in near quantitative yields, e.g., for analysis by gas chromatography. The method is useful in specialized organic synthetic operations but is considered too hazardous and expensive for large scale applications. The reactions are irreversible simplifying work-up. Since acyl chlorides and acid anhydrides also react with water, anhydrous conditions are preferred. The analogous acylations of amines to give amides are less sensitive because amines are stronger nucleophiles and react more rapidly than does water. This method is employed only for laboratory-scale procedures, as it is expensive. Although not widely employed for esterifications, salts of carboxylate anions can be alkylating agent with alkyl halides to give esters. In the case that an alkyl chloride is used, an iodide salt can catalyze the reaction (Finkelstein reaction). The carboxylate salt is often generated in situ. In difficult cases, the silver carboxylate may be used, since the silver ion coordinates to the halide aiding its departure and improving the reaction rate. This reaction can suffer from anion availability problems and, therefore, can benefit from the addition of phase transfer catalysts or highly polar aprotic solvents such as DMF. Direct routes to this same ester are not possible because vinyl alcohol is unstable. Ozonolysis of alkenes using a work up in the presence of hydrochloric acid and various alcohols. Anodic oxidation of methyl ketones leading to methyl esters. Esters react with nucleophiles at the carbonyl carbon. The carbonyl is weakly electrophilic but is attacked by strong nucleophiles (amines, alkoxides, hydride sources, organolithium compounds, etc.). The C–H bonds adjacent to the carbonyl are weakly acidic but undergo deprotonation with strong bases. This process is the one that usually initiates condensation reactions. The carbonyl oxygen is weakly basic (less so than in amides) but forms adducts. Esterification is a reversible reaction. Esters undergo hydrolysis under acid and basic conditions. Under acidic conditions, the reaction is the reverse reaction of the Fischer esterification. Under basic conditions, hydroxide acts as a nucleophile, while an alkoxide is the leaving group. This reaction, saponification, is the basis of soap making. This reaction is not usually reversible. Hydrazines and hydroxylamine can be used in place of amines. Esters can be converted to isocyanates through intermediate hydroxamic acids in the Lossen rearrangement. Sources of carbon nucleophiles, e.g., Grignard reagents and organolithium compounds, add readily to the carbonyl. Compared to ketones and aldehydes, esters are relatively resistant to reduction. The introduction of catalytic hydrogenation in the early part of the 20th century was a breakthrough; esters of fatty acids are hydrogenated to fatty alcohols. A typical catalyst is copper chromite. Prior to the development of catalytic hydrogenation, esters were reduced on a large scale using the Bouveault–Blanc reduction. This method, which is largely obsolete, uses sodium in the presence of proton sources. Especially for fine chemical syntheses, lithium aluminium hydride is used to reduce esters to two primary alcohols. The related reagent sodium borohydride is slow in this reaction. DIBAH reduces esters to aldehydes. Direct reduction to give the corresponding ether is difficult as the intermediate hemiacetal tends to decompose to give an alcohol and an aldehyde (which is rapidly reduced to give a second alcohol). The reaction can be achieved using triethylsilane with a variety of Lewis acids. As for aldehydes, the hydrogen atoms on the carbon adjacent ("α to") the carboxyl group in esters are sufficiently acidic to undergo deprotonation, which in turn leads to a variety of useful reactions. Deprotonation requires relatively strong bases, such as alkoxides. Deprotonation gives a nucleophilic enolate, which can further react, e.g., the Claisen condensation and its intramolecular equivalent, the Dieckmann condensation. This conversion is exploited in the malonic ester synthesis, wherein the diester of malonic acid reacts with an electrophile (e.g., alkyl halide), and is subsequently decarboxylated. Another variation is the Fráter–Seebach alkylation. Phenyl esters react to hydroxyarylketones in the Fries rearrangement. Specific esters are functionalized with an α-hydroxyl group in the Chan rearrangement. Esters with β-hydrogen atoms can be converted to alkenes in ester pyrolysis. A direct conversion of esters to nitriles. As a class, esters serve as protecting groups for carboxylic acids. Protecting a carboxylic acid is useful in peptide synthesis, to prevent self-reactions of the bifunctional amino acids. Methyl and ethyl esters are commonly available for many amino acids; the t-butyl ester tends to be more expensive. However, t-butyl esters are particularly useful because, under strongly acidic conditions, the t-butyl esters undergo elimination to give the carboxylic acid and isobutylene, simplifying work-up. Many esters have distinctive fruit-like odors, and many occur naturally in the essential oils of plants. This has also led to their commonplace use in artificial flavorings and fragrances when those odors aim to be mimicked. 1 2 March, J. Advanced Organic Chemistry 4th Ed. J. Wiley and Sons, 1992: New York. ISBN 0-471-60180-2. ↑ McGee, Harold. On Food and Cooking'. 2003, Scribner, New York. ↑ Williams, Roger J.; Gabriel, Alton; Andrews, Roy C. (1928). "The Relation Between the Hydrolysis Equilibrium Constant of Esters and the Strengths of the Corresponding Acids". J. Am. Chem. Soc. 50: 1267–1271. doi:10.1021/ja01392a005. ↑ Ignatyev, Igor; Charlie Van Doorslaer; Pascal G.N. Mertens; Koen Binnemans; Dirk. E. de Vos (2011). "Synthesis of glucose esters from cellulose in ionic liquids". Holzforschung. 66 (4): 417–425. doi:10.1515/hf.2011.161. ↑ Neumeister, Joachim; Keul, Helmut; Pratap Saxena, Mahendra; Griesbaum, Karl (1978). "Ozone Cleavage of Olefins with Formation of Ester Fragments". Angewandte Chemie International Edition in English. 17 (12): 939–940. doi:10.1002/anie.197809392. ↑ Makhova, Irina V.; Elinson, Michail N.; Nikishin, Gennady I. (1991). "Electrochemical oxidation of ketones in methanol in the presence of alkali metal bromides". Tetrahedron. 47 (4–5): 895–905. doi:10.1016/S0040-4020(01)87078-2. ↑ W. Reusch. "Carboxyl Derivative Reactivity". Virtual Textbook of Organic Chemistry. ↑ Yato, Michihisa; Homma, Koichi; Ishida, Akihiko (June 2001). "Reduction of carboxylic esters to ethers with triethyl silane in the combined use of titanium tetrachloride and trimethylsilyl trifluoromethanesulfonate". Tetrahedron. 57 (25): 5353–5359. doi:10.1016/S0040-4020(01)00420-3. ↑ Sakai, Norio; Moriya, Toshimitsu; Konakahara, Takeo (July 2007). "An Efficient One-Pot Synthesis of Unsymmetrical Ethers: A Directly Reductive Deoxygenation of Esters Using an InBr3/Et3SiH Catalytic System". The Journal of Organic Chemistry. 72 (15): 5920–5922. doi:10.1021/jo070814z. PMID 17602594. ↑ Wood, J. L.; Khatri, N. A.; Weinreb, S. M. (1979). "A direct conversion of esters to nitriles". Tetrahedron Letters. 20 (51): 4907. doi:10.1016/S0040-4039(01)86746-0.